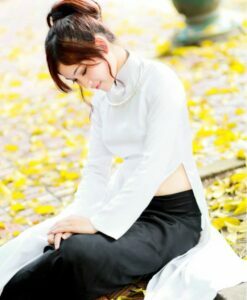 We Sell Ao Dai Viet Nam in Beige Chiffon for both Top dress and Pant. 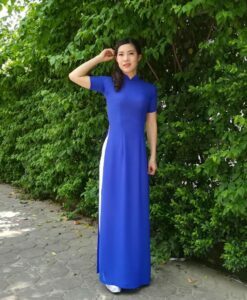 This is the thick chiffon material which unique color. It has a long lap, V neck, and long sleeves. The color and design as on the pictures. 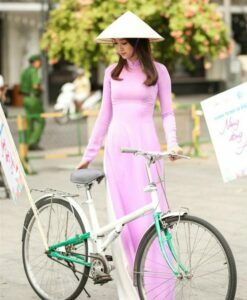 Due to the limitation in shipping time, so we were not able to wash your Ao Dai before shipment. There may have the chalk marks on your dress. Also, for transportation needs, the dress that you’ve received will have a fold phenomenon. Please don’t worry, this fold situation will disappear after the first time washing and hang it on. We do not recommend you to use the hot ironing if you do not have the experience to use it.